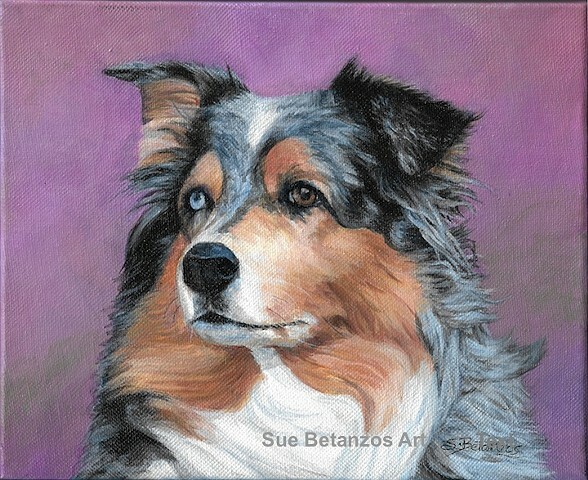 Australian Shepherd original acrylic portrait is lovely in a magical orchid color background. A lovely merle Aussie painted on archival wrap canvas. Those bi-color intelligent Aussie eyes! Waiting for your next command as Aussies do. A Perfect gift for Australian Shepherd lovers and rescue groups. Painted in acrylics on archival wrap canvas. The painting is ready to hang or can be framed. This painting was a painting demonstration and is now looking for her Forever Home!